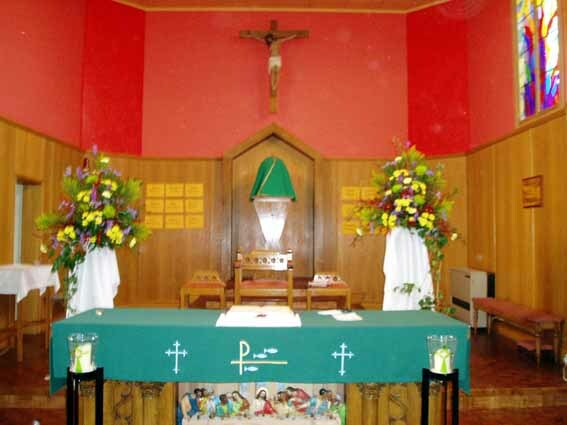 This photograph of the main altar as it was from the time the church opened was used to make a calendar which was sold to raise funds for the church. The altar table is the one we have now with the 3-D coloured Last Supper and carved oak pillars. The crucifix may well be the one we have hanging above the sacristy now, but seems rather small. (See 2004 below for new information). 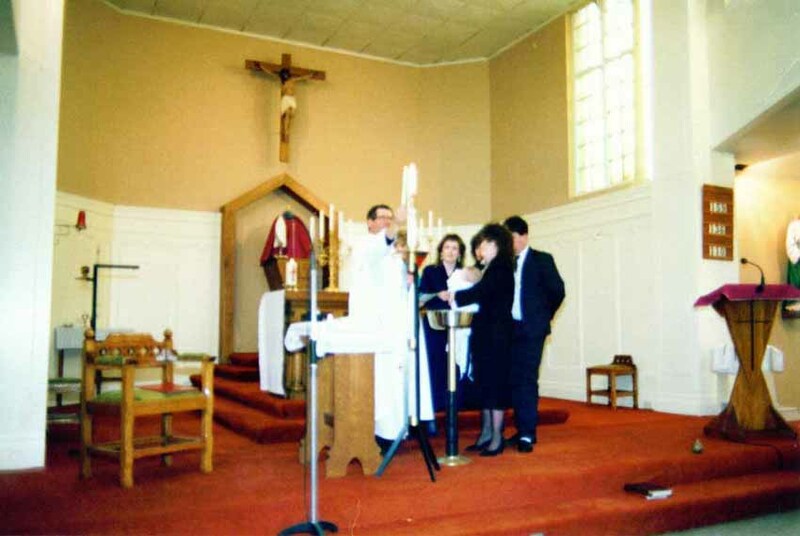 The reredos (the intricately carved back of the altar) was removed when the altar was brought forward to allow the priest to face the congregation following Vatican 2. It was riddled with woodworm and had to be destroyed. Whatever happened to the two figures on either side of the cross (Mary and St John?) remains a mystery! 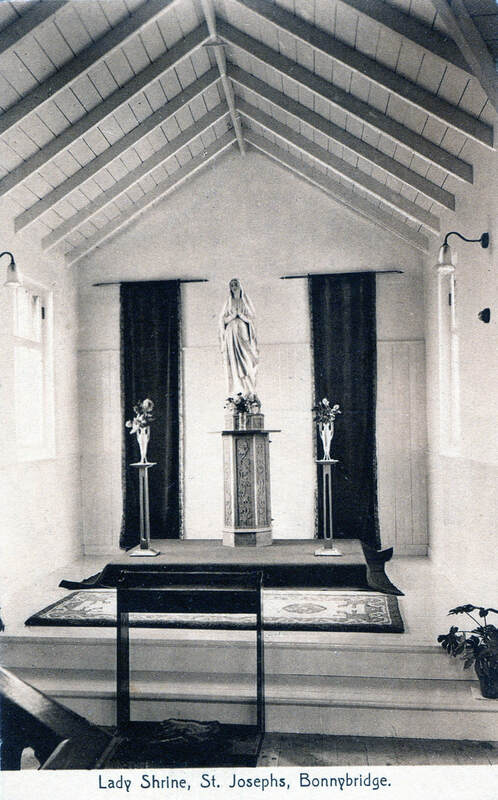 This postcard photo shows the Lady Altar (or shrine) probably in the mid 1920s. 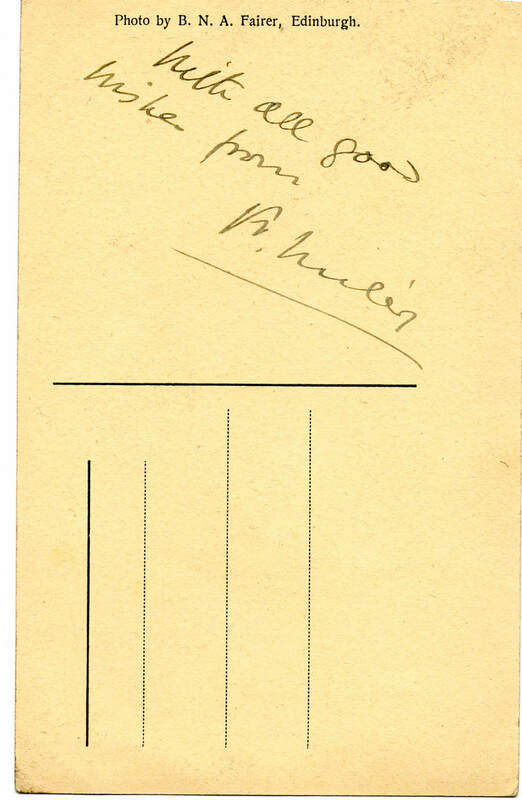 The back of the postcard is signed by Fr Miley who served as Parish Priest from 1922-1928. The picture shows the 'open roof' construction of the early church and the shrine lacks the altar shown in the photograph above. However the statue looks as if it is the same as the one in the picture above - the one we have today. 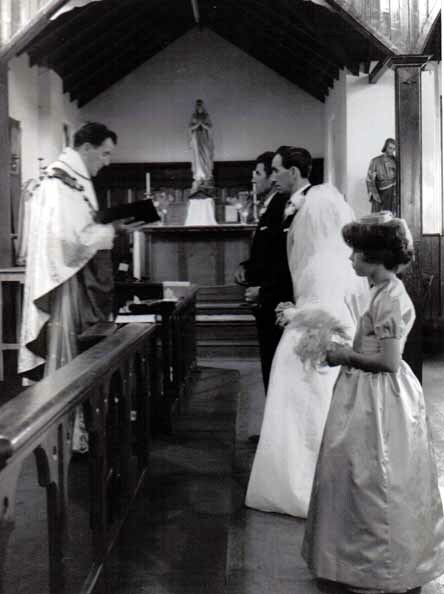 A visiting priest conducts a wedding in the late 60s (?) giving a good view of the open rafters above the Lady Altar. I wonder who is most nervous - bride, groom, best man, bridesmaid or priest? Note the intricate wooden back of the altar (the reredos), the dark wood panelling, the altar rails, the pulpit and the open ceiling in the side passageways. 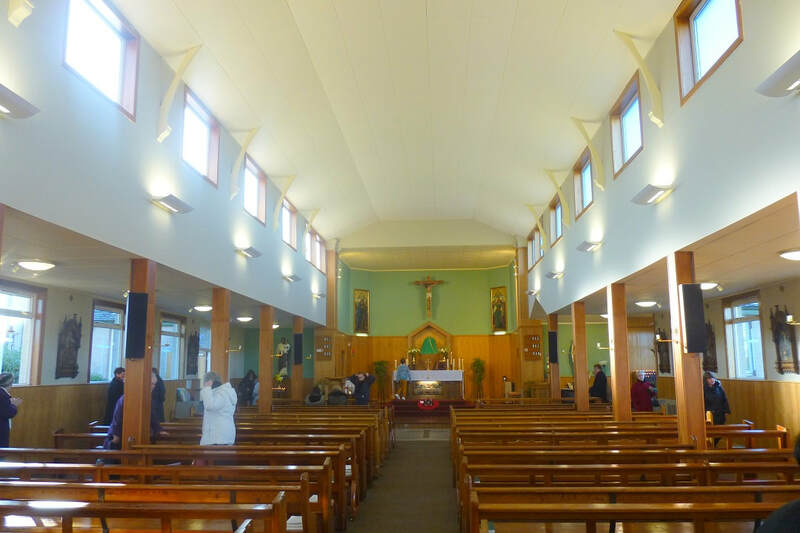 Note also that there is no central aisle separating the pews; the fluorescent lighting suspended from the roof; the open arches and roof trusses of the side aisles. The altar itself has the familiar wooden columns of the present altar - just to the right of the groom. Some time after 1970 (post Vatican 2)This picture is poor quality but it has been restored enough to show that the old reredos has been removed (it had woodworm!) The altar has been brought forward so that the priest now faces the congregation. 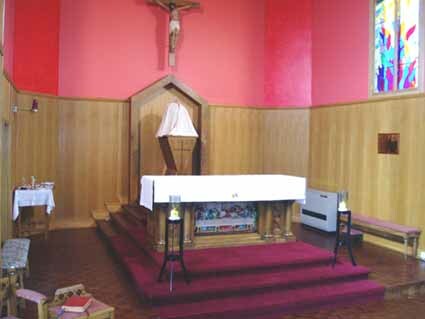 However the old altar rails are still in place! The altar itself has a cloth with a picture of Our Lady hanging in front. Notice how the roof above the altar is fully open to the rafters. 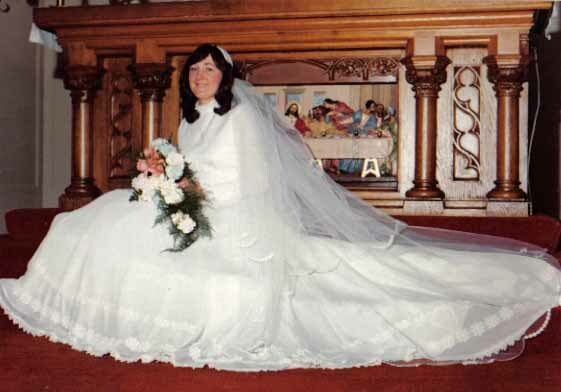 A happy bride in front of the altar in 1982 - the colourful three-dimensional Last Supper panel and the carved wooden pillars and inlays are plain to see. The altar has been moved right up to the front of the Sanctuary. The former white-painted panelling has been replaced by light wood panelling. The carpet has been removed to reveal the original parquet flooring. The back wall has been painted brightly. The colourful 3-D 'Last Supper' is in plain sight for all to see. The new Holy Spirit stained-glass window is installed. Close-up for the Last Supper at the front of the Main Altar Produced by an Italian Artist this is a near-perfect representation of Leonardo da Vinci's masterpiece. It has been suggested that the beardless figure to the left of Jesus as we look at the picture is Mary Magdalene, and certainly the face is very feminine, but then so are the other two beardless figures - third and fourth from the right of the picture. Slight changes have been made - mainly by adding some carpeting to the central area of the sanctuary to reduce slipping dangers and keep down noise! Notice more obviously how the roof has been tiled over - probably to reduce heating costs as well as enhancing the look of the church. 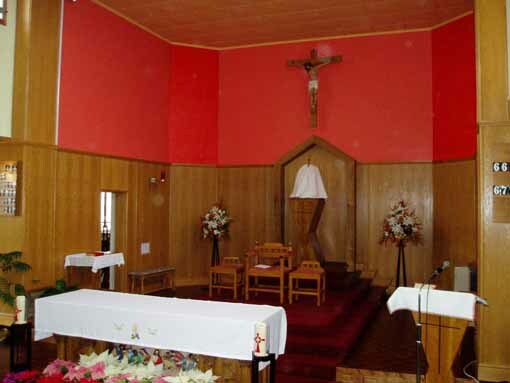 The figure on the crucifix above the main altar is the original figure from the original altar but the cross was re-crafted in Japanese pine by Edward Kiernan who still resides in the parish. Our thanks to John Smith for this information. The altar now sits on the top platform above the steps giving the congregation a clear view of the Mass ceremony.